The United Arab Emirates’ first robotic police officers will join the Dubai Police in May, officials have confirmed. The robots will make up 25 percent of the force by 2030. The UAE are rolling out their first batch of real-life robot cops in Dubai as part of their plan to make the city “one of the best five” in the world for security. “We are looking to have more robots in future to handle policing. 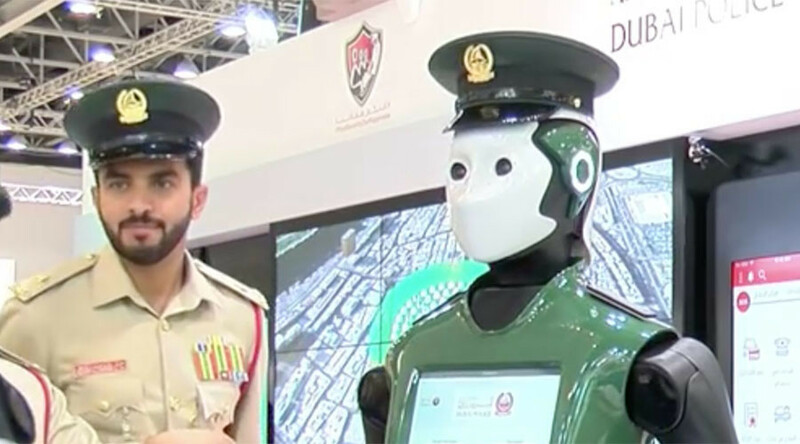 By 2030, we are keen to make robots around 25 per cent of the total police force,” Brigadier Abdullah Bin Sultan, director of the Future Shaping Centre of Dubai Police, told Gulf News. Along with a strong robot force, by 2030 all police buildings in Dubai will be 50 per cent self-power-generating and the city will have “many smart police mechanisms” including a police station that won’t require human employees, according to Brigadier Khalid Nasser Al Razouqi, the general director of the Smart Services Department at Dubai Police. The models were first unveiled at the Gulf Information Technology Exhibition (GITEX) in October 2015. The multilingual robot’s interactive touchscreen can scan faces and allows members of the public to report crimes and pay traffic fines. “We’re expecting for it to be in tourist areas at first in 2017, near Burj Khalifa, GPR, City Walk and by 2020 we want to have a more thorough area covered,” Major Adnan Ali, head of Dubai Police’s Technical Innovations Department, said in 2016.